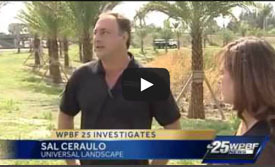 Information on Building A Pool - Universal Landscape, Inc. 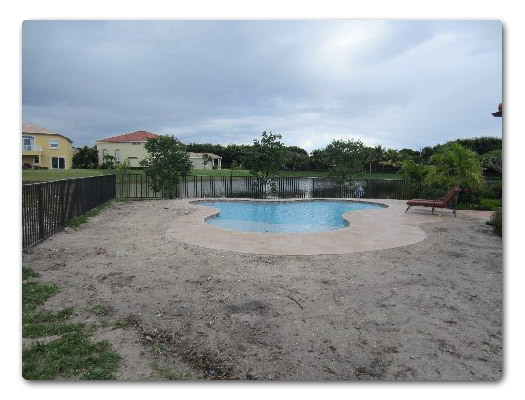 Whether it is a commercial project or a residential one, many people are faced with some similar needs by the time the pool is done. Maybe you’ve heard about us from your general contractor or pool builder, received our name by referral, or are finding out about us here for the first time. 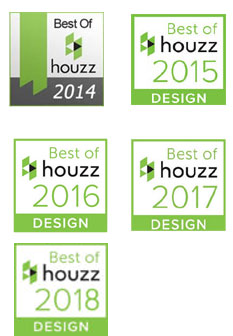 Whichever it may be, our first promise is that we strive to be amongst the best contractors you would ever hire. That comes from respecting our clients, helping to determine exactly what kind of look you are going for in a budget that’s comfortable for you, and then trying to exceed expectations. There are a number of different ways we serve people who are having this work done. 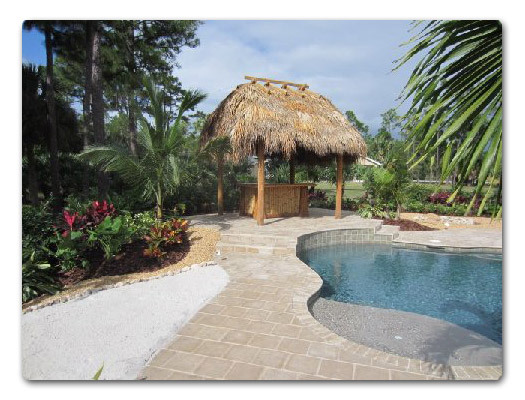 While people’s budgets, styles and properties can vary greatly and no two jobs are ever the same as each is custom, we’ve broken down our work into 3 different categories here, for what you may need or expect from us in the finishing touches of building a pool. 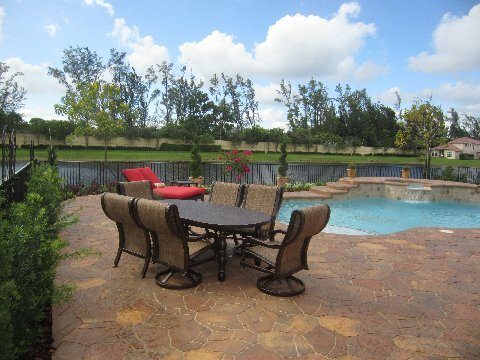 Whether it is a new home or a new pool, whenever there is construction being done, more often than not, we find that any number of different trades may have left some debris or scraps laying around after they’ve left, concrete clumps, etc. 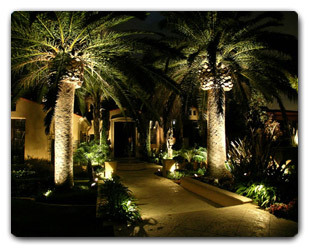 Landscapers are usually the last to arrive – and so, with some projects, we are often called upon to clean up the site. 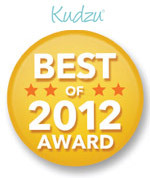 Call (561) 722 – 0252 or contact us HERE. 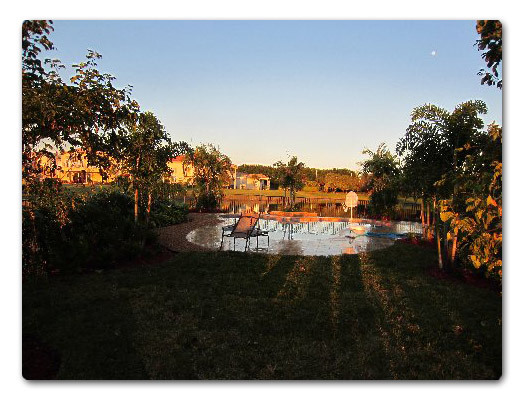 The requests we receive for the landscapes around a pool can vary greatly with different styles, budgets and properties. Some layouts can be created in our initial consultation with a simple sketch when the desire is simply for a light dress up of the surrounding area. In these cases we may be able to provide an estimate on the spot. The majority of our customers are looking for something more substantial. 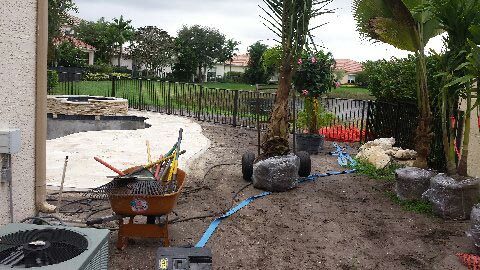 The installation of a landscape setting to frame the area, brightening it up with an assortment of different colors and sometimes fragrance, speakers or lighting. There are many different styles we can provide, but our initial job is to learn the particular style that suits the atmosphere you wish to create as well as suiting the lifestyle you live. 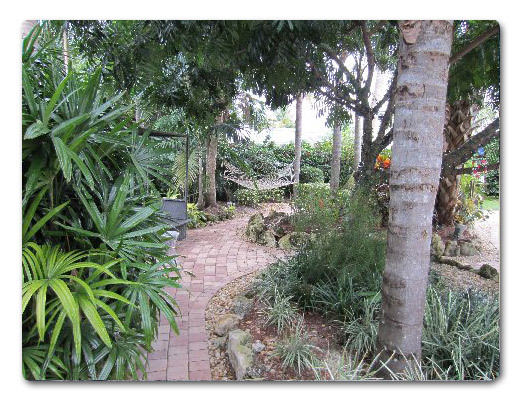 To learn more about our approach and offerings in regards to landscape design visit our residential page. 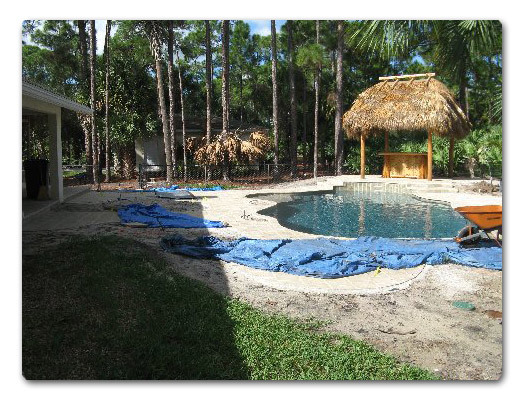 Our work building pool waterfalls is either performed at the time the new pool is being constructed or as an add on to the existing pool. Whichever it is, there is no work we perform that can help transform an area like the sight and sound of the waterfalls we add to these settings. As in a painting of a natural scene, they become instant focal points of eye catching attention. Beyond their natural beauty, many customers have commented on how the sound of the waterfall is valuable in itself. 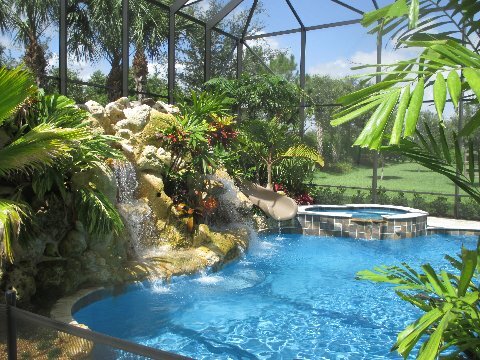 Whether entertaining or simply closing one’s eyes and only hearing the sound of a natural cascade of water provides many with a sense of their own secluded oasis. If you are considering having one built for you, we guarantee they truly are, a rewarding addition to any property. 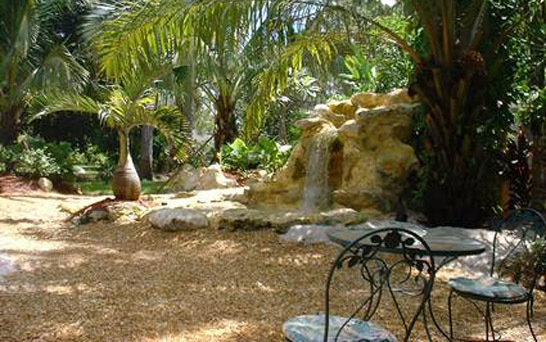 As with landscape designs, we approach waterfall construction as an art form, and nothing less. While it is an art, there are 3 main points which are a factor in every project and we will cover these points briefly here for you. These are some points which should be noted, no matter who builds your waterfall. FOUNDATION : It begins with the mind set of providing a project that is built to last. 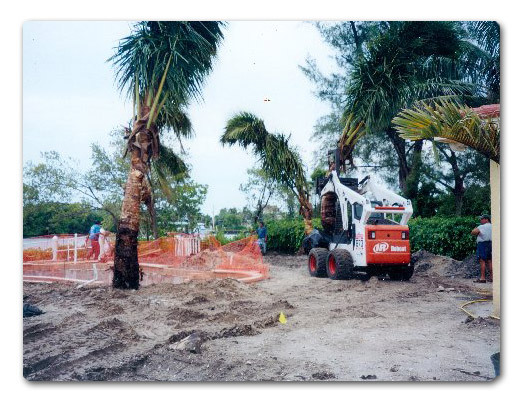 If it is a stand alone waterfall, or if attached to a pool, the foundation and shell are the first major factors to constructing a strong, durable job. Now some pool builders may provide the shell or ‘pan’ of the waterfall for us when they construct the pool, some may not; regardless – every job has a fiber mixed concrete base re-enforced by rebarb steel. This is important on every job, and the larger the waterfall – the more important this becomes. Each ‘pan’ or shell that the waterfall is built within is then waterproofed with a sealant. These may seem like mundane points, but they make a great difference between a professional project and an inferior job. 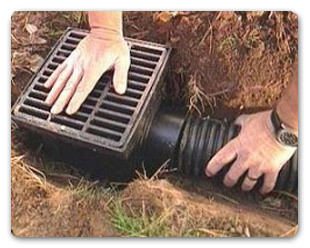 PLUMBING : Making sure that the proper plumbing size lines and pipe strengths are installed allow for the desired flow strengths. ‘GPM’ is an important point when building a waterfall. GPM stands for ‘Gallons Per Minute’ which is the rate of flow that water is to flow on a waterfall. As each job is custom, maybe your pool design has allowed for waterfall plumbing, but still the design and project you desire may have a different need than was originally planned. This is not a big issue to take care of, a simple and very inexpensive change when handled before hand, often at no additional cost. A mistake here, and you can wind up with a beautiful job, but the water flow is lacking and can take away from the whole project. 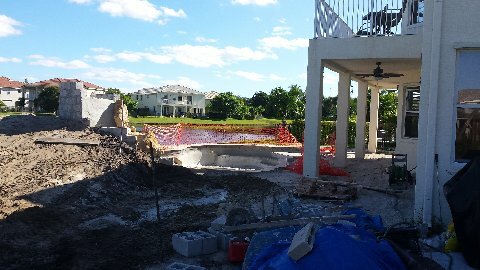 NOTE ON PLUMBING : With new pools – it is important that the correct plumbing intake and outflow piping is installed BEFORE the concrete shell of the pool is put in. On the great majority of our work – we install real, natural rock waterfalls. Why ? First – they are stronger than man made rock formations. Second, faux rocks try to look real. Third, simple longevity. They don’t fade, they’re easy to clean, and they look natural because they are. 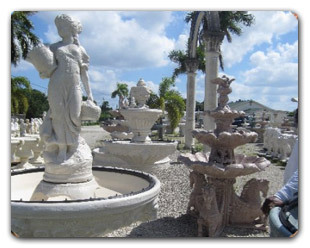 Whatever your taste, faux or real rock, we can accommodate you. For some projects, we will absolutely suggest that faux rock is the way to go. 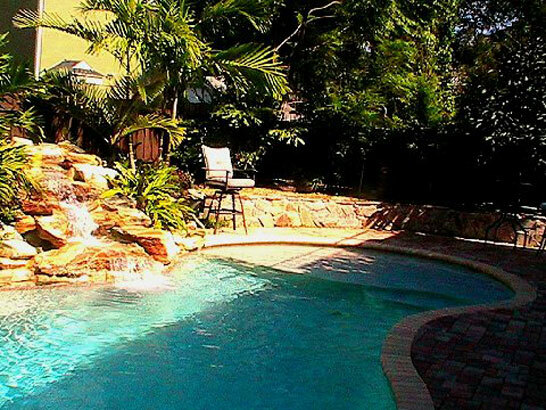 Cost is about the same – but when dealing with a swim in cavern area or a pool project with large overhead waterfall spills to swim under – faux rock, because of its light weight, is the best way to go for safety in our opinion. NOTE : On the choice of rock – waterfalls are an art to create -and this will show through in whichever material you choose. Faux or Real – we can make either choice look beautiful and provide you with a number of different color shades or rock styles to cater to the look you may desire. When it comes to price, we deal with different size pools, customer desires, and budgets – and then there are some projects where it may not be a complete waterfall some wish for. For example, some may have some rock coping around a pool and an ‘Elevated Jacuzzi’ with a simple spill edge into a pool, and not a ‘waterfall’. We’ll address the ‘Elevated Jacuzzi’ (Sample A), a ‘Waterfall Jacuzzi’ (Sample B) and a traditional ‘Waterfall’ (Sample C) all here. A Basic Waterfall package begins from about $8,600 – whether on a pool or a Jacuzzi. The simpler ‘Elevated Jacuzzi’ including rock coping and spill edge, with boulder accents is represented in the Sample A photo. 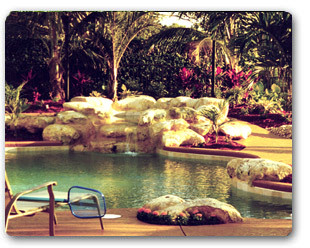 Set around the pool starts from around $4,200. 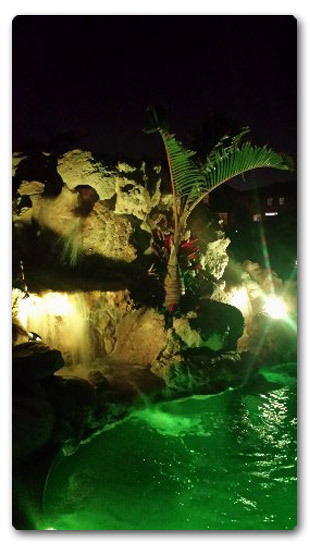 Photo B to the right is a Jacuzzi Waterfall example and Photo C is an example of a standard beginning size for waterfalls. (As with all waterfall packages – samples B & C include the price of a single waterfall pump, which is typically requiring a 120 to 150 GPM pump. Piping should be 3″ lines for the intake and outflow.) This is the most typical starter range for most projects. Note on Sizes & Cascades : No two waterfalls we build are exactly the same, and we are not so concerned with the number of cascades or the size of the waterfall as we are with the finished look. The number of cascades, as well as the drop heights are customized to create the certain kind of sound each customer is going for. Grotto fronts help to give more of a deeper sound than one with many mulit-layered cascades. Both are in the same budget range – again it is the look and sound of each that is customized for each individual. Note on rear ‘Soil Retention Wall Shouldering’ : In the Sample photos B & C above; Sample B has a low elevated rear shoulder wall and Sample C does not. While the photos never really do full justice to the work, by lifting the soil levels in the bed around the waterfalls helps to settle in the look of the waterfall more naturally. Sample B reflects a thin area we worked in, inside a porch screen. The backdrop of the soil elevation helped the height of each rock course blend in more naturally, than being close up with the rock standing at 5 ‘ high above the surrounding ground and plant levels. Never seen a waterfall in nature where the rock of a stream or waterfall was not contoured in with the surrounding ground levels. Many companies do not even think about including this option to settle in the waterfall project… common sense to us. THE STONE YOU CHOOSE & OUR COMBINED IMAGINATION: There’s two simple main points in terms of the style of our designs – first – they are customized to the look you are going for . 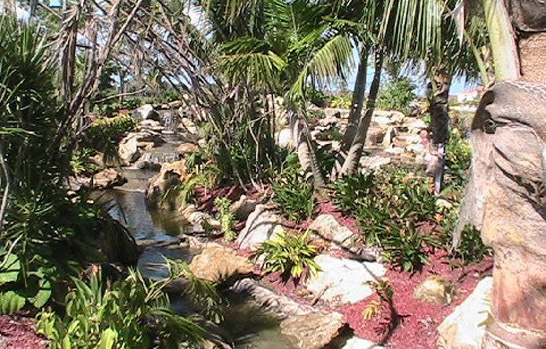 So if it’s a soft, gentle cascade, a mountain creek style stream, or a jungly scene with crashing waterfalls that fill an area with sound – we can build them to suit any style. 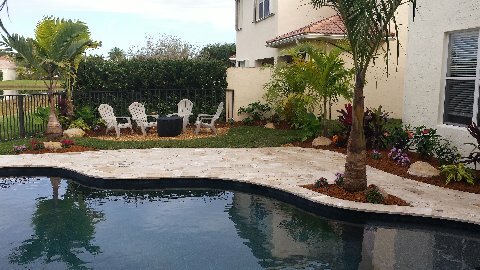 The choice of stone / boulder you choose has a lot to do with the look, and here in Florida Cap Rock is the natural stone, the most inexpensive to supply and is commonly used. It’s great for tropical scenes. For a northern scene – or any setting you may choose – we can provide photos / samples for you to choose from to help make a decision. 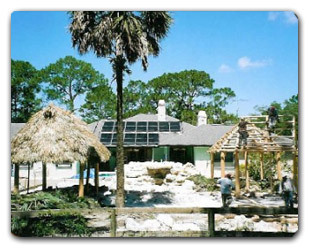 The stone of choice is a major factor in the style of waterfall being built for you. So, if you’re looking for ideas, have photos or magazine clippings of waterfalls you may like, in our Free Consultation – we will go through those notes you have, portfolios of our own – and generate new ideas as we talk about the potential scene. Any kind of waterfall, any style of rock – our limitations are the imagination itself when it comes to style and function. The second main point that helps to create the style or look is the sound that you’re going for. Plain and simple, each cascade, each ‘bowl’ that the water splashes into and out of produces a sound. The type of sound you are going for has a direct effect on how we think to build it. Like tuning an instrument, different length cords or different shapes produce different sounds, the same with the height of a cascade, the water flow strength, the surface or bowl it falls through, as well as shaping or chiseling the rocks to create a certain formation for a distinct sound. In short, with your call and an appointment time set, have you’re imagination ready, because no matter what the style or shape or sound, this work is truly an Art and each job is customized to each individual customer. We look forward to the chance of serving you and creating one of the Most transformative projects people have done on their properties. 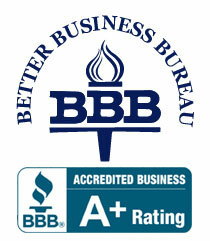 Call Today for a FREE CONSULTATION & FREE ESTIMATE !